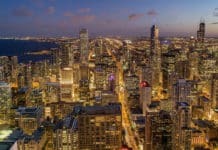 More than half the world’s human population lives in cities, and that’s forecast to swell by another 2.5 billion people by 2050, according to the U.N. That poses tremendous challenges for everyone — from governments, businesses and non-profit organizations to every individual resident. Furthermore, rapid urbanization is making people more vulnerable to the impacts of climate change, according to an April 2017 report from the U.N. Framework Convention on Climate Change (UNFCCC). “The frequency of torrential rain and storm surges is on the rise in big, densely populated cities like New York, Mumbai and Jakarta, hitting those living in marginalized, informal settlements like slums the hardest. Desertification swallows arable land needed to feed swelling urban populations. And sea level rise threatens everyone living in coastal areas, delta regions, and small-island countries,” the report authors state. Dealing with all this requires strategic planning and close cooperation among stakeholders throughout the economy and society. “Through initiatives such as 100 Resilient Cities and the Global Covenant of Mayors, leaders of cities have shown commitment to work together to address climate change and its impacts. Support from global organizations such as the World Bank, ICLEI, UN-Habitat, have also made various resources available to policy-makers, practitioners and even individuals willing to take action,” the UNFCCC report authors highlight. Solar, wind and other environmentally friendly renewable and smart energy technologies play a key role. Cities and renewable electricity have, respectively, become the habitat and energy of choice globally. The two are increasingly inseparable. As cities vie to attract growing businesses, talent, and innovation in an increasingly global competition, solar and wind power have become key for many in achieving their smart city goals. — according to the Deloitte report’s authors. Led by Marlene Motyka, Deloitte’s research team first turns its attention to “exploring the urbanization and electrification trends that have turned cities and the grid into leading platforms for human activity. Technology can help make these platforms smarter by providing actionable data, but technology’s greatest value lies in its people-centered deployment — that is, to the benefit of all citizens/customers ,” according to the report authors. Smart cities research, strategy development and implementation is one of Deloitte’s focal points as an organization, Motyka explained. It has developed a platform called the 360-degree smart cities framework that offers stakeholders a wide-ranging tool and resources to help develop and implement smart cities development strategies. 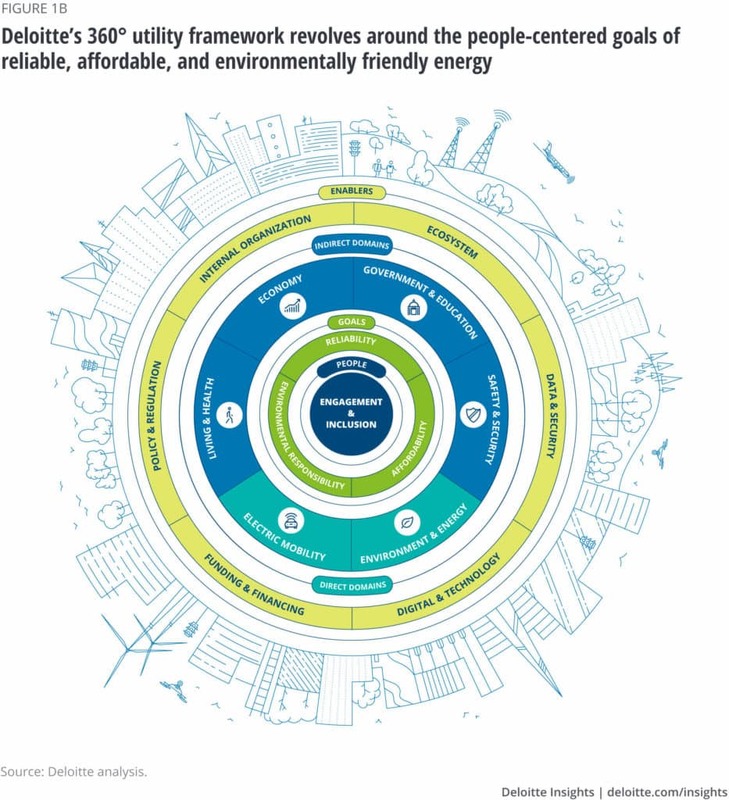 Three overarching goals guide and inform development of people-centered smart cities in Deloitte’s framework: economic growth, sustainability and quality of life. Expanding outward from this center circle are key smart city domains, which encompass government and education, safety and security, living and health, economy, mobility and energy and environment. A third circle of the framework sets out key enablers: policy and regulation, internal organization, ecosystem, digital and technology, data and security, and funding and financing. 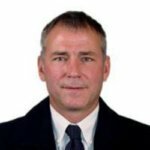 “We don’t hear a lot about energy [specifically in the context of smart cities], and with so much happening with renewables, we found that the utilities framework really connects and overlaps nicely with that smart city framework…It’s a mirror framework that we used to identify and analyze SRCs,” Motyka explained in an interview. 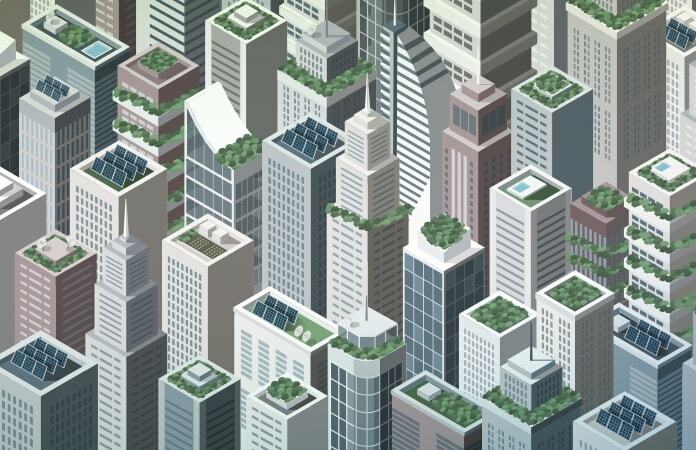 Deloitte’s 360-degree smart city and utility frameworks share two domains: energy and environment, and mobility, but utilities can serve as key enablers of smart city initiatives across other domains, Motyka explained. “Cities and utilities serve the same people and organizations within the city, whether as citizens or customers,” the research team highlights. The Deloitte team used the mirror, 360-degree utility framework to identify and analyze the biggest, the purest and the newest smart renewable cities worldwide. “Solar and wind power are the linchpins to aligning and achieving both sets of goals [those of smart cities and utilities]…SRCs are already powered by solar and wind and envision the further deployment of these sources as integral to their smart city plans ,” the research team states. 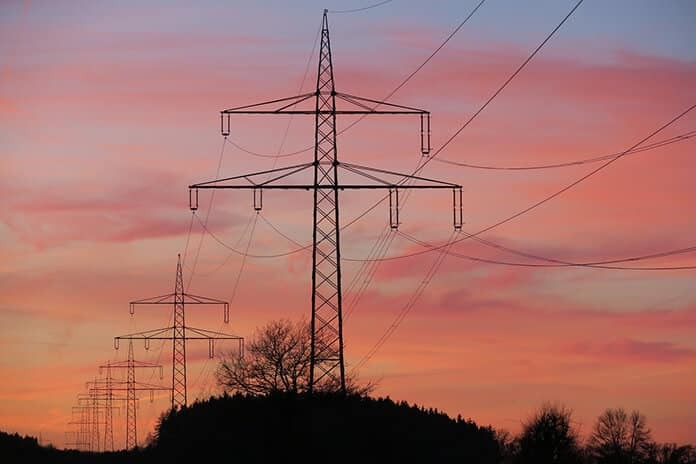 Investing in and learning to make the most effective use of smart grid technologies is one way utilities can and are leveraging their infrastructure to serve smart city initiatives. They can do the same in other areas outside of energy to advance smart renewable city development, however, the Deloitte team points out. “For example, a utility’s smart meters can be harnessed to detect water leaks; smart transformers can host air quality sensors; and smart streetlights can be augmented with charging stations, video cameras, Wi-Fi, and sensors to collect data on anything from vehicular and pedestrian traffic patterns to parking spot availability. Utilities also have a connection to virtually every home and business, to which they can extend smart city initiatives via smart home systems. Thus, utilities can help serve people-centered smart city goals across the energy, economy, mobility, health, government, and safety domains,” the research team highlights. When it comes to mobility and transportation, ongoing development and growing adoption of electric vehicles (EVs) and digital, solid-state power electronics in place of traditional, fossil-fueled equipment and devices in industry and commerce are making important contributions to the development of smart renewable cities. Transportation systems often rely on electricity, and that can come from renewable sources. You can get different, multiple benefits from that — an enhanced transportation system that uses cleaner, more efficient forms of transport, such as electric buses. Renewables can be used to support electric rail systems. This offers a broader purview of how utilities can figure into smart cities’ bigger picture. — Motyka told Solar Magazine. Essentially, utilities have to, and gradually are, becoming more externally oriented. That’s certainly the case when it comes to investing in and learning how best to leverage and capitalize on rapid technological innovation and evolution, especially when it comes to distributed renewable and digital power and energy technologies, such as battery-based energy storage. Not all utilities are at the same level or stage of development, Motyka added. “Some are willing and able to do more and move faster. The environment is changing and given renewables are very important given their cost-effectiveness. And by their nature, making the best use of them entails utilities engaging and working more closely with customers and other stakeholders,” she said. The biggest cities probably face the most and greatest challenges when it comes to evolving into smart renewable cities. That’s because their infrastructure and built environment is so extensive and longstanding. That makes for complex environments, which is compounded by the rapid pace of technological, regulatory and social change, according to Motyka. 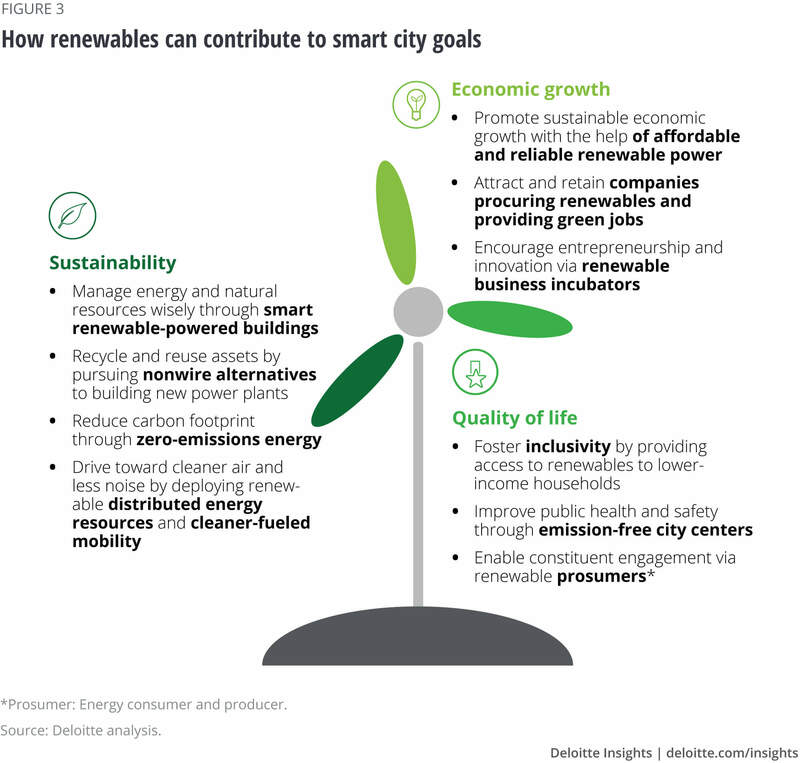 Tokyo ranks as the biggest smart renewable city Deloitte’s research team identified. Although renewables account for just 1 percent of Tokyo’s power generation capacity at present, the city is taking some bold steps along the smart renewable city path. 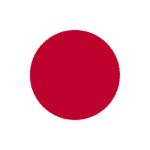 That includes Japan’s first vehicle-to-grid (V2G) smart city project between Toyota and utility Chubu Electric Power Co. Deploying EV charging start-up Nuvve’s V2G platform, project partners intend to find out how bidirectional EV charging can balance the supply and demand of electricity on the grid. “It’s a good example of utilities, government, automakers and tech companies coming together to increase renewable power generation while keeping electricity prices down,” Motyka said. San Diego, California also ranks among Deloitte’s biggest smart renewable cities. Besides working to achieve statewide 100 percent zero-carbon-energy-by-2045 and solar residential rooftop goals, San Diego’s own smart city initiatives are prime examples of public and private-sector organizations joining together to carry out strategic, city-wide projects and programs. “As big as some of these cities are, it takes a really focused, village mentality to develop and see these sorts of initiatives through,” Motyka said. Motyka singled out Colorado’s Peña Station NEXT as a good example of the newest, greenfield smart renewable city projects around the world. Peña Station NEXT entails investor-owned, Colorado utility Xcel Energy working closely with government and other private and public-sector organizations to build a new community centered on clean energy and mobility. Copenhagen, Denmark ranks among the purest smart renewable cities in the world, according to Deloitte’s framework. 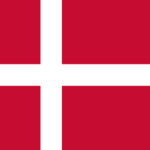 A member of the Go 100% Renewable Energy initiative, the city has set a goal of being 100 percent carbon-neutral in terms of energy by 2025, and it’s working to meet Denmark’s national goals of 100 percent renewable power and heat by 2030 and 100 percent renewable energy by 2050. Cities looking to evolve into smart renewable cities face numerous and varied challenges. 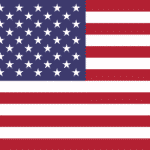 “There are regulatory and environmental challenges, for example. Someone said that regulation always lags innovation — that’s part of the challenge here. Furthermore, these can be complex environments, especially for some of the biggest cities with lots of existing infrastructure. Trying to figure out a good strategy and path, and getting the timing right is not simple or easy. Lots of things need to be considered, thought through, leveraged and connected. 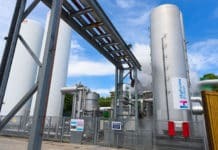 Energy is complicated, especially when set in a period of rapid technological innovation, increasing complexity and pace of change,” Motyka said. The rewards in terms of the Deloitte framework’s three overarching goals: economic growth, sustainability and quality of life are within reach, however, according to Deloitte. 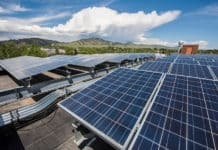 Furthermore, solar has emerged as the first choice when it comes to the renewable energy resources cities heading down the smart renewable cities path aim to leverage and capitalize on. “When you look at renewables, the vast majority are looking at solar and wind. Bigger cities don’t necessarily have a lot of vacant land, so solar really is a key factor. It can be put on rooftops, as part of urban in-fill development, etc.,” Motyka said.